The United States basic and applied research market remains very large, amounting to nearly $200 billion per year, and we are optimistic on the prospects of the International Space Station (ISS) U.S. National Laboratory and broader low Earth orbit (LEO)-based research to gain an increasing importance in this spending mix. Over decades of space exploration, we have seen the range of space-based research applications and technology platforms expand substantially across technology development, life sciences, physical sciences, and remote sensing areas, and we are seeing continued strengthening of the ecosystem to execute and de-risk ISS-based projects. As widely discussed, the space industry’s launch, upmass, and downmass capabilities are continuing to increase. And while costs have still meaningful potential to decline, we see the economics of space-based research as already increasingly attractive in terms of return on capital, as reflected in the ability to unlock revenue opportunities and reduce project uncertainties and costs. We have provided some of our observations and thoughts below. Every year U.S.-based companies as well as our federal and state governments spend sizable resources toward R&D, delivering scientific achievements and enhancing the country’s growth and competitiveness. This spending amounted to a total of $538 billion in 2017, per R&D Magazine data, and is expected to grow by nearly 3% in 2018. Private industry funded approximately 65% ($348 billion) of this research and development (R&D) spending in 2017 and federal government, public, and academic institutions contributed the remaining 35% ($190 billion). In 2018, approximately 17% of this spending is expected to fund basic research and 19% applied research, while 64% is expected to be directed toward development activities. Private industry R&D accounted for only 22% of basic research spending in 2017 (R&D Magazine estimates, versus 56% from academic institutions) but was responsible for 64% of applied research and 87% of development spending. 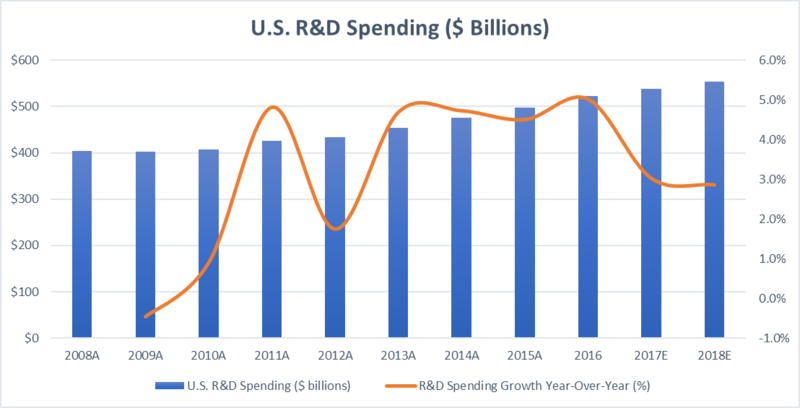 Figure 1: U.S. R&D spending reached $538 billion in 2017 with expected growth of nearly 3% in 2018. Within private industry, the largest R&D spending areas are information and communications technologies, which accounts for approximately 35% of the total expenditure, and life sciences, which accounts for more than 20%. The automotive industry accounts for approximately 10%, and aerospace/defense and advanced materials are both individually approaching mid-single-digit share in the industry R&D spending mix. Drilling further down, of the pharmaceutical industry R&D spending of $53 billion in the U.S. in 2014, approximately 22% ($11 billion) was directed toward preclinical research. Figure 2: Estimated U.S. R&D spending mix for 2018. Historically, ISS-based microgravity research, harsh environment testing, and Earth observation amount to only a very small part of our country’s overall research investment, and while all these areas have seen significant development since the start of the human spaceflight era, the flows of activity here have been subject to fluctuations in government funding. However, based on cumulative spaceflight R&D results; broadening launch, upmass, and downmass capabilities; declining unit costs for transportation; and an expanding ecosystem of space-specific R&D implementation and test platforms, we believe there is a significant potential for ISS National Lab research applications to expand. For various commercial industries, it has taken some time to learn about and locate value-added opportunities in space-based research. The great news is that with almost 300 payloads delivered to the ISS National Lab since 2013, the ISS National Lab has seen a broad range of projects deployed that have the potential to open up more than $110 billion in addressable markets and contribute to the development of products and solutions targeting more than $900 million in incremental revenue. The range of research areas leveraged here is nothing short of impressive, and we have provided some of the examples in the figure below. Figure 3: Possible project objectives and research focus areas. 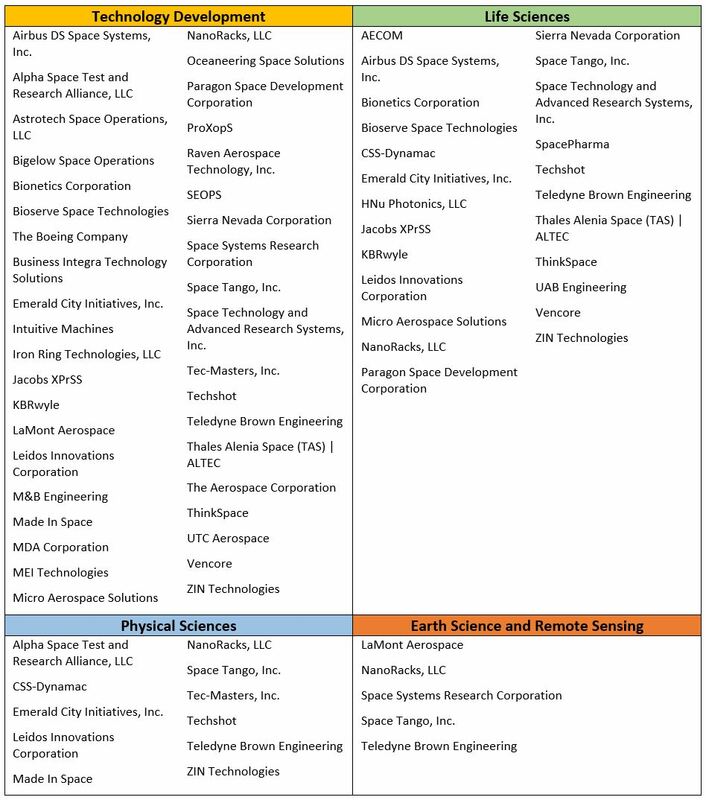 Indicative of the deepening breadth of available research solutions, the ISS National Lab ecosystem now includes a total of 44 implementation partners that can help commercial companies execute and de-risk space-based projects. These partners have extensive expertise in translating science from the lab bench to space-qualified hardware and experimental systems, and many deliver an existing set of flight-tested products and platforms. 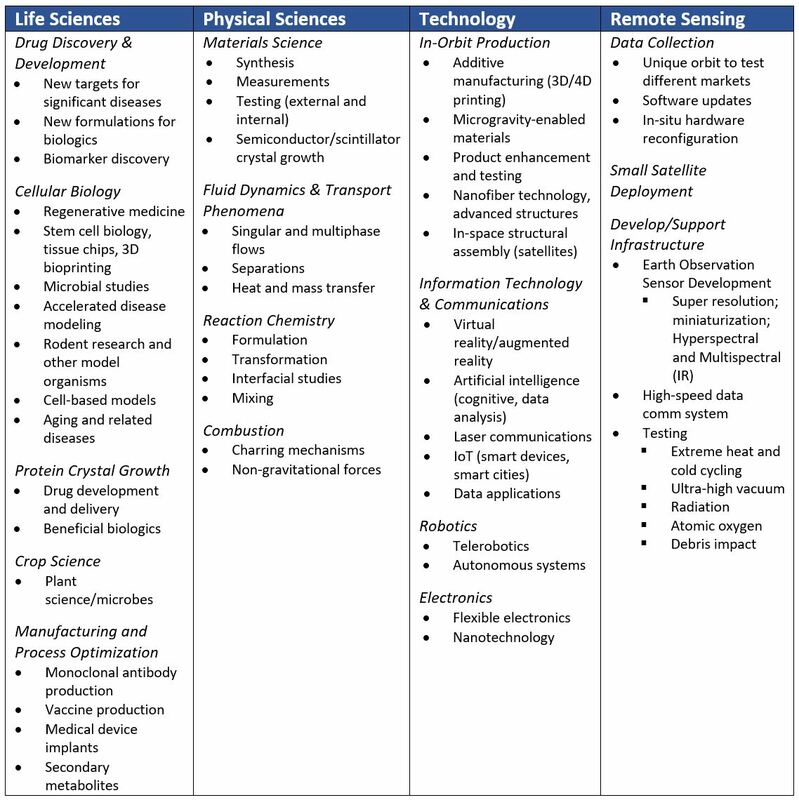 Several implementation partners provide technology platforms across two or more industry verticals and, as can be seen from the figure below, 39 are active in the technology development vertical, 24 in life sciences, 11 in physical sciences, and 5 in Earth sciences and remote sensing. It is important to note that a few of these implementation partners are working on future space habitat capabilities as well, which could serve as an expansion and/or extension to the current ISS National Lab platform in the years to come. Figure 4: List of ISS National Lab implementation partners across research areas. We have provided below our general thoughts on how to look at the economics of space-based research projects, as well as two examples approximating real-life projects we have seen. Our project economics analysis below compares costs of space-based research with incremental revenue opportunities generated as a result of such research (assuming it is successfully completed) and attempts to answer the question of how much revenue is needed to financially justify such a project. 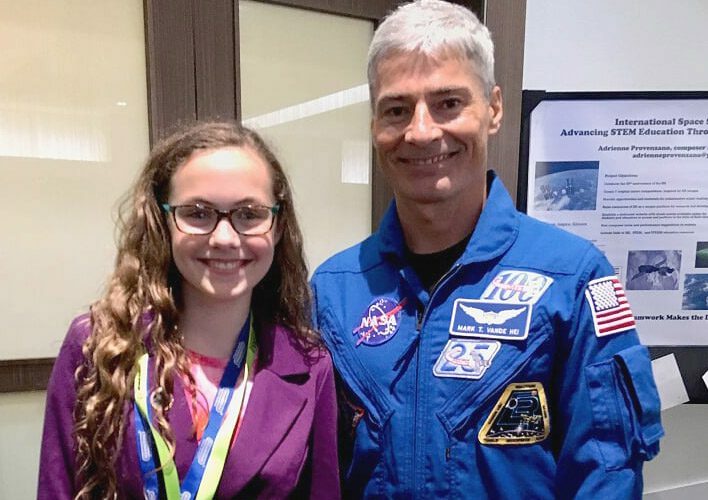 There can be several reasons for such additional revenue generation from such research, as we have seen from projects submitted to the ISS National Lab. For example, a project can lead to superior properties of a newly developed product, which should position it for market share gains, or the research would allow acceleration in time-to-market relative to competition, which also allows for capture of additional revenue. To assess economic value creation potential from a financial management perspective, we have estimated the annual revenue requirements, taking into consideration the fact that different industries, companies, and products have different cash flow margins, and that product-specific cash flows change over time (see Figure 5 ). Obviously, companies do not invest capital without return expectations, so our analysis incorporates generous internal rate of return (IRR) hurdle rates as well. Figure 5: Schematic of a product’s cash flow profile through its life cycle. 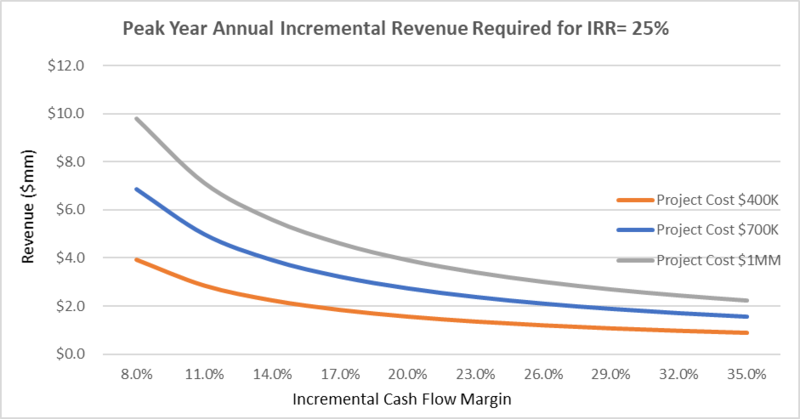 Our focus is on incremental cash generation as it relates to the underlying incremental revenue opportunity, and one way to think about the cash flow margins shown in the charts below is EBITDA (earnings before interest, taxes, depreciation, and amortization) with R&D expense and non-cash stock-based compensation added back. As product revenues change over the lifecycle of the product, the revenue numbers cited below refer to expected product cycle peak year performance. Finally, all the analyses are on a pre-tax basis. Now we will look at some examples approximating real life projects. 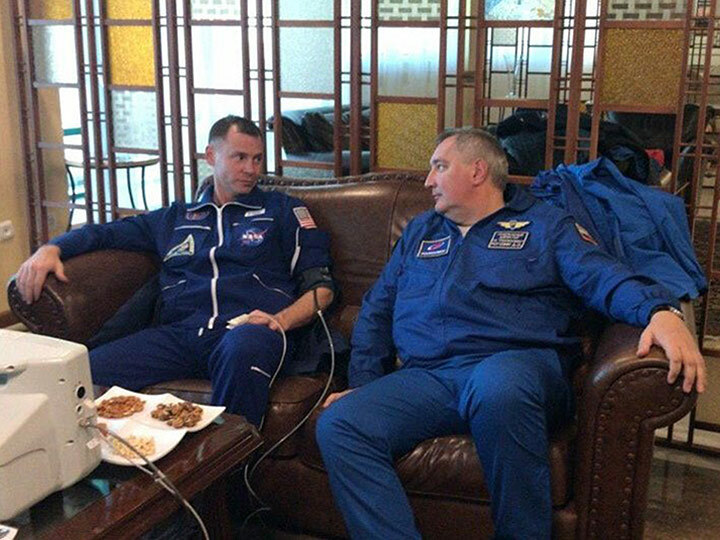 For one such project focused on a personal care product, a commercial company used microgravity conditions to develop a new product with increased competitive performance, which it expects to translate into global market share gains. 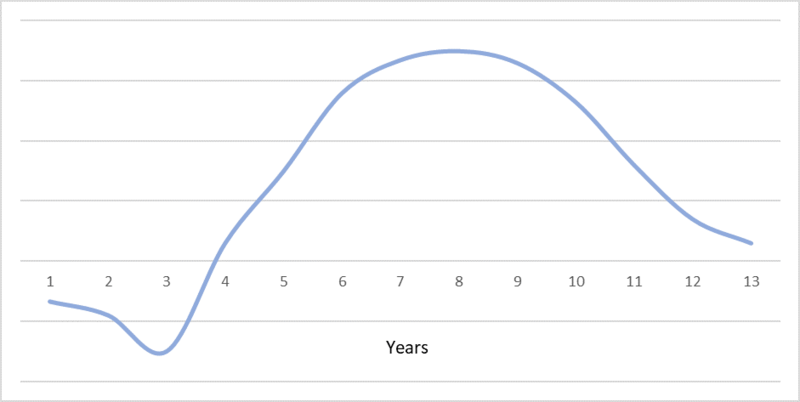 For this project, we have used a range of all-in ISS National Lab research project cost estimates and assumed that the project spending occurs three years ahead of the actual project launch with a typical product life cycle revenue curve (see Figure 5) thereafter. 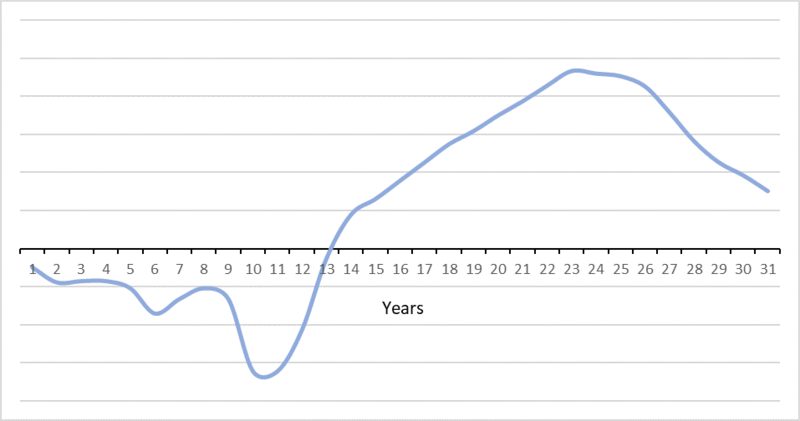 In Figure 6 we present an analysis showing that if we set the IRR hurdle rate at 25%, set all-in project costs of $400K to $1 million, and assume a typical project revenue lifecycle, the incremental revenue requirements for cycle peak year are relatively modest, implying to us attractive project economics. Note that if a company is running repetitive projects on the same or similar technology platform, the upfront project development costs will likely be lower, resulting in further improvement in return on capital. Figure 6: Personal care product example—incremental revenue required to justify a research project costing $400K to $1 million. For simplicity’s sake, we have used a 25% IRR requirement, which is generous, and should be attractive in most corporate contexts. Furthermore, we have assumed a range of all-in research project costs from $400K to $1 million. Project costs can vary broadly, depending on the complexity and duration of experiments required, and the used range includes costs for a company’s internal project preparation, costs of transitioning to and operating space-ready technology platforms, as well as flight and postflight expenses. Applying a similar financial analysis to a project that is a preclinical drug development study, the economic picture in terms of revenue hurdle rates is likely to be different. This is largely due to the long drug development cycle times, development uncertainty (i.e., risk of failing to reach drug approval), and longer revenue cycles for approved drugs before facing competition from generics (see Figure 7). We have seen several research projects seeking to leverage the ISS National Lab’s microgravity and accelerated-aging environments toward the goal of downstream improvements in therapeutic treatment and target molecule identification, which should favorably impact the drug development probabilities and hence the risk-weighted costs. Figure 7: Estimated approved drug cash flow profile. To highlight potential economic impacts, we have assumed here an ISS National Lab project with an investment amount of $700K, on par with actual figures we have seen in the past. 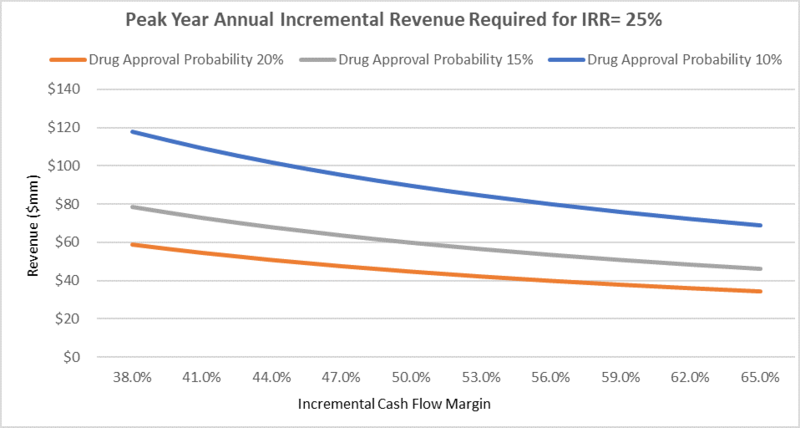 Furthermore, we have assumed a typical approved drug cost/revenue life cycle (see Figure 7), a range of incremental cash flow margins typical to the industry, as well as a range of probabilities for the drug under development reaching an actual approval. We continue to use 25% IRR hurdle rates. As shown in Figure 8, the incremental revenue requirement is higher here, with the drug approval probability as a key variable as mentioned before. However, given the demographic trends (such as an aging population) resulting in sizable end-market opportunities, as well as the industry’s long patent protection periods, the required revenue levels are not prohibitive, and the economic profile of ISS National Lab-based studies should look increasingly attractive. Figure 8: Preclinical study example—incremental revenue required to justify a $700K research project. In summary, our view is that spaceflight R&D makes increasing economic sense. 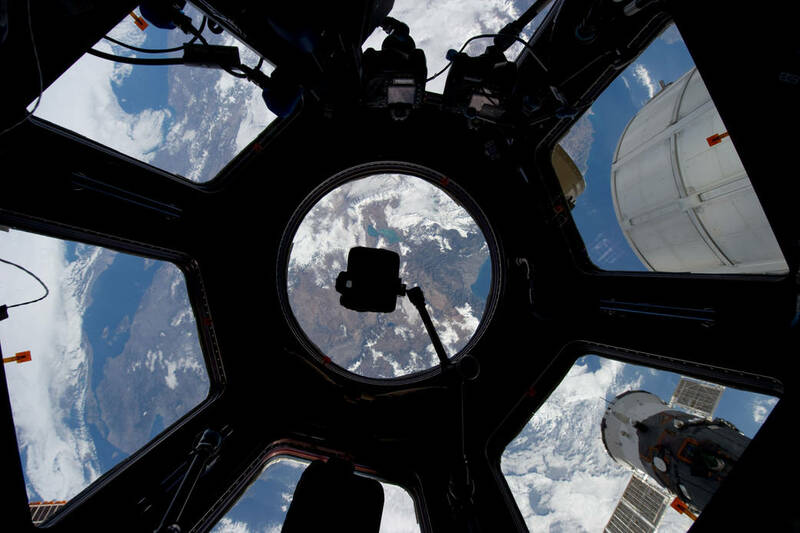 Historically, conducting research in space has been resource consuming, and on an absolute-dollar basis, it still requires material commitments. However, in our view, the economics of such research is reaching cost points that are increasingly able to deliver positive returns on invested project capital, at relatively low levels of required incremental revenues.